Touted as one of the most under-rated niche verticals of the bulk and specialty chemicals industry, rubber processing chemicals market has been garnering considerable momentum in the past few years. The overwhelming expansion of the automobile and construction businesses across the globe has been an instrumental factor in propelling the demand for rubber processing chemicals. These chemicals are majorly utilized in rubber processing facilities to improve the physical attributes of rubber, which is consequentially used in automobiles. Moreover, these chemicals are utilized in sealants, roofing materials, sound insulation, and floor coverings in the residential and commercial buildings, essentially highlighting the significance of rubber processing chemicals in the overall construction industry. The exponential increase in the sales of automobiles across various countries has led to an escalation in tire manufacturing, which is the most significant application of rubber processing chemicals industry. According to trusted estimates, the worldwide sales of passenger cars reached 78.6 million units in 2017, thus positively affecting the business of rubber production. In addition to this, major tire manufacturers have been expanding their existing manufacturing capacities to gain a competitive advantage in a fast-evolving business vertical. For instance, the Japan-based tire maker Toyo Tire & Rubber Co. Ltd has recently announced to invest USD 62 million to expand its bus and truck tire production units in Malaysia and China. Even though the commercialization prospects of rubber processing chemicals market appear highly promising, it would be prudent to take note of some major regulatory guidelines across various nations that may hinder the pace of product penetration in the near future. Numerous prominent government authorities along the likes of the Environment Protection Agency in the United States and European Commission have been proactive in laying down stringent regulations pertaining to the utilization and disposal of rubber processing chemicals. Implementation of these regulations is considered as highly crucial as most of the toxic rubber processing chemicals are discharged in water bodies – a practice that poses an immense threat to the aquatic life and is known to have an adverse impact on biodiversity. Considering the aforementioned factors, various companies partaking in rubber processing chemicals industry are undertaking several programs that focus on procurement of natural rubber and incorporation of sustainable rubber processing practices. The Japanese tire manufacturing firm Yokohama Rubber Company, for instance, has recently launched a new purification system at its rubber processing facility in Thailand. Remarkably, the system recycles the water utilized at the facility which assists the company in protecting the natural environment and establishing a trust-based relationship with local residents. Apart from working to expand the supply chain and formulate production methodologies that conform to the sustainable practices, numerous specialty chemicals manufacturers have been acquiring firms involved in producing rubber processing chemicals. The French specialty chemicals giant Arkema has recently acquired the operations of the Italy-based Oxido. For the record, Oxido predominantly manufactures organic peroxides that are utilized in synthetic rubber crosslinking. Elaborating further on the prospective impact of the buyout, it is likely to boost the downstream integration of organic peroxide across various business in Europe. Especially, the takeover is aimed at fulfilling the growing demand for processing chemicals from the synthetic rubber industry given that organic peroxide is used extensively in the vulcanization of rubber. Owing to the swift deployment of sustainable processing methods by various rubber manufacturers and incorporation of advanced technologies at rubber production facilities, the rubber processing chemicals market share is slated to progress at a commendable pace in the years ahead. 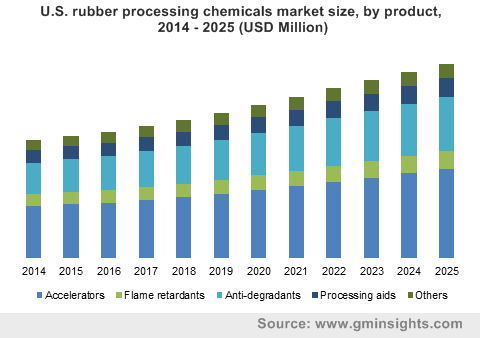 In fact, as per a research study put together by Global Market Insights, Inc., the remuneration scale of rubber processing chemicals industry is expected to surpass 5 billion-dollar mark by 2024. The competitive hierarchy of the global rubber processing chemicals market is being spearheaded by major corporations along the likes of Merchem Limited, R.T. Venderbilt Holding Company, Inc., Sumitomo Chemicals, Linkwell, Emerald Performance Materials, AkzoNobel N.V., Eastman Chemical Company, Kumho Petrochemicals, Solvay S.A., BASF SE, and Lanxess.